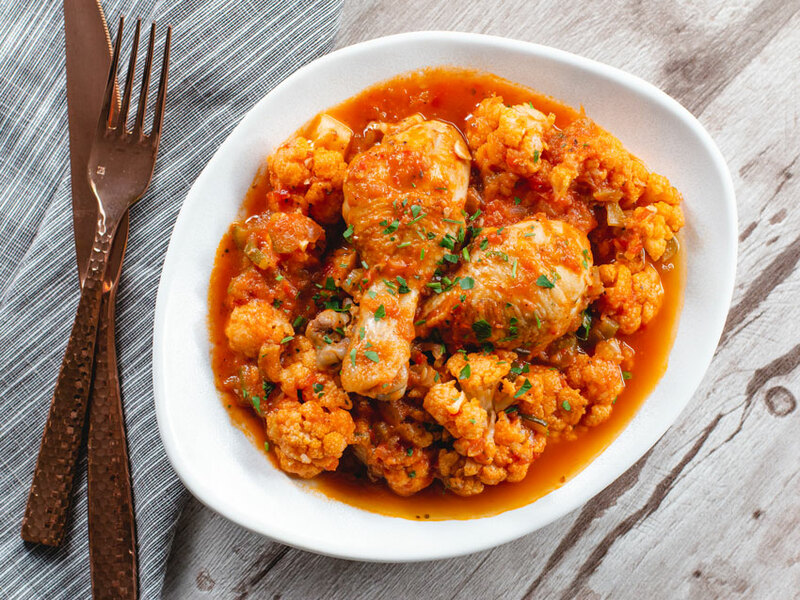 Quick and easy chicken cacciatore made in the instant pot with a side of tender cauliflower. The enitre low carb recipe is made in the instant pot and the chicken falls off the bone. 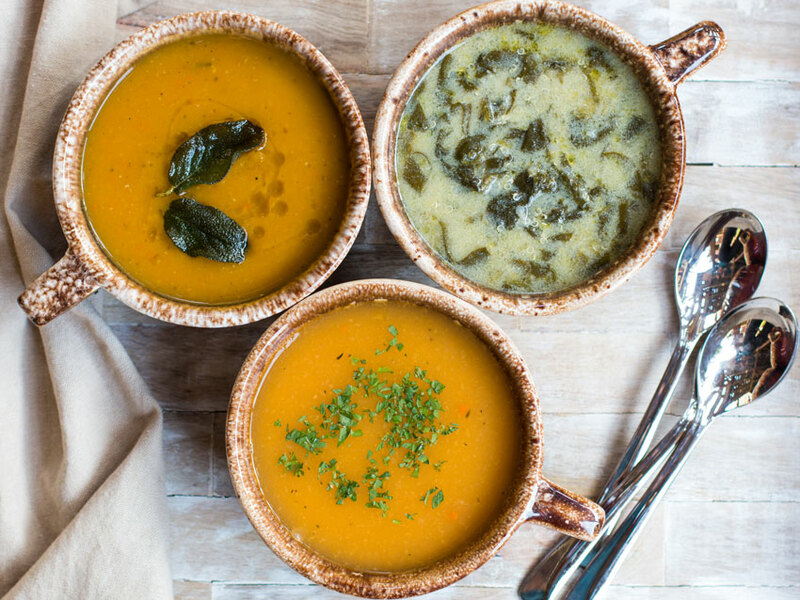 Now that winter is here, we need some hearty comfort food recipes that will keep us warm. This chicken cacciatore is so easy to make and everything happens inside the instant pot, which makes for an easy clean up. The chicken thighs are pressure cooked with white wine, low carb veggies, and good quality canned tomatoes. Just 10 minutes in the instant pot will yield tender, falling off the bone chicken drumsticks. Take the leftover tomato sauce that has been infused with all of those yummy flavors and cook the cauliflower florets for just 1 minute, and dinner is done. If you want some other instant pot recipes, check out my chicken pot pie and winter minestrone soup. Making chicken cacciatore in the instant pot is easy. First season the chicken thighs with a generous amount of salt and pepper and brown on the highest saute setting. This will add another layer of flavor to the dish. Once that is done, take the chicken out and add the onions, zucchini, celery, and oregano. Take the time to cook the veggies down. This will take a good 10 minutes. Next up add some garlic and tomato paste. I love cooking tomato paste for a minute, it adds a rich flavor to the chicken cacciatore. Then add the chicken back to the instant pot along with a can of crushed Italian tomatoes, chicken stock, and white cooking wine. Season everything with another 1/2 teaspoon of salt and set the instant pot to pressure cook on high for 10 minutes. After 10 minutes of cooking time is up, let the Instant Pot sit for 10 minutes, and then carefully release the pressure. You will notice how tender the chicken drumsticks are and how the meat has pulled back from the bone. 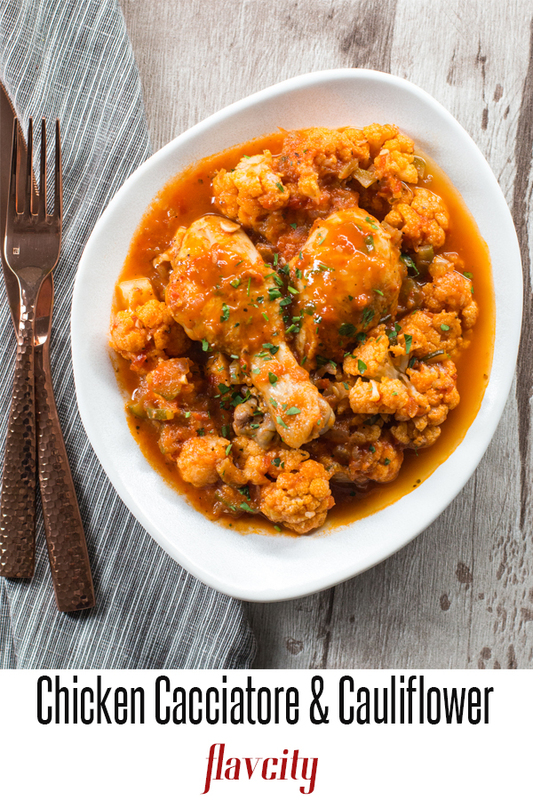 Remove chicken and place the cauliflower florets in the Instant Pot with the remaining tomato sauce. Set pressure cook to high for zero minutes. I know it sounds weird, but by the time the pressure has built up, the cauliflower has cooked through and longer, it will be mushy. Can I Make Chicken Cacciatore In The Crock Pot? You can make chicken cacciatore in the crock-pot by following these exact instructions and setting the cook time to 7 hours on low. The chicken will be tender and the sauce will be full of yummy flavors. If your crock-pot does not have a brown setting, you can skip that step and just put everything in the pot and start slow cooking. What Should I Serve With Chicken Cacciatore? 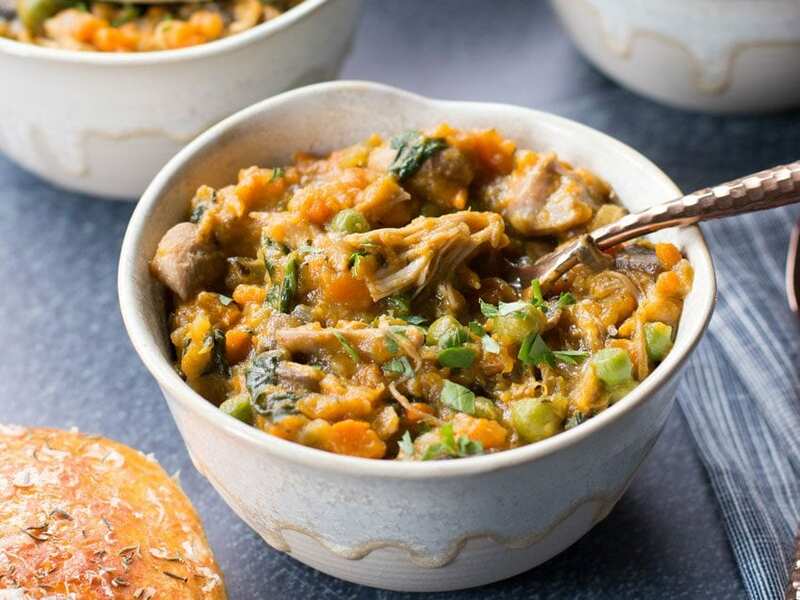 It is nice to have some fresh and crunchy vegetables with any type of dish that has been pressure cooked in the Instant Pot or braised low and slow. This recipe comes with cauliflower, but you could also serve it with crispy brussels sprouts made in the pan or roast spaghetti squash. This instant pot chicken cacciatore recipe is easy to make and has big time flavors. All of the cooking takes place in the instant pot, and the chicken is moist and tender. Pre-heat heat the instant pot to the highest sauté setting and season the chicken drumsticks with a generous pinch of salt and pepper on all side. Add 1 tablespoon of oil to the pot along with the chicken, there should be room to fit all 6 drumsticks. Sear for 3-4 minutes on both sides or until golden brown. Remove chicken from pot and turn the heat down to medium sauté setting. Add another 2 teaspoons of oil to the pot if needed along with the onions, celery, zucchini, oregano, ½ teaspoon salt, and a few cracks of pepper. Mix well and cook for 10 minutes. Add the garlic and cook for 2 minutes. Add the tomato paste and cook for one minute and then add the chicken back to the pot along with the cooking wine, chicken broth, can of tomatoes, bay leaf, ½ teaspoon salt, and a few cracks of pepper. Mix well, place the lid on the instant pot, and set to pressure cook on high for 10 minutes. After 10 minutes of cook time, let the instant pot sit for 10 minutes and then release the steam manually. Remove the chicken and add the cauliflower florets to the pot with the sauce and pressure cook on high for zero minutes. Release the steam and remove the cauliflower. Cooking the cauliflower any longer will make it mushy. 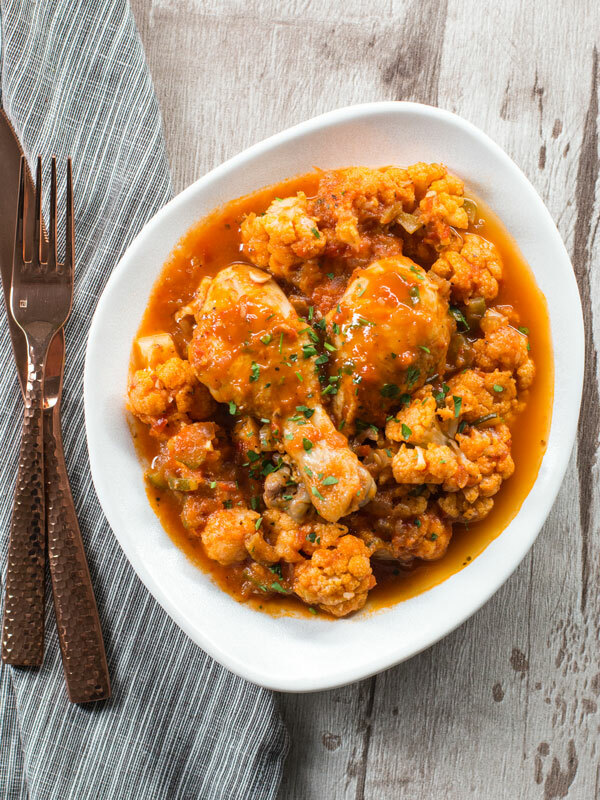 Serve the chicken cacciatore with the cauliflower, spoon some sauce over and garnish with parsley, enjoy! 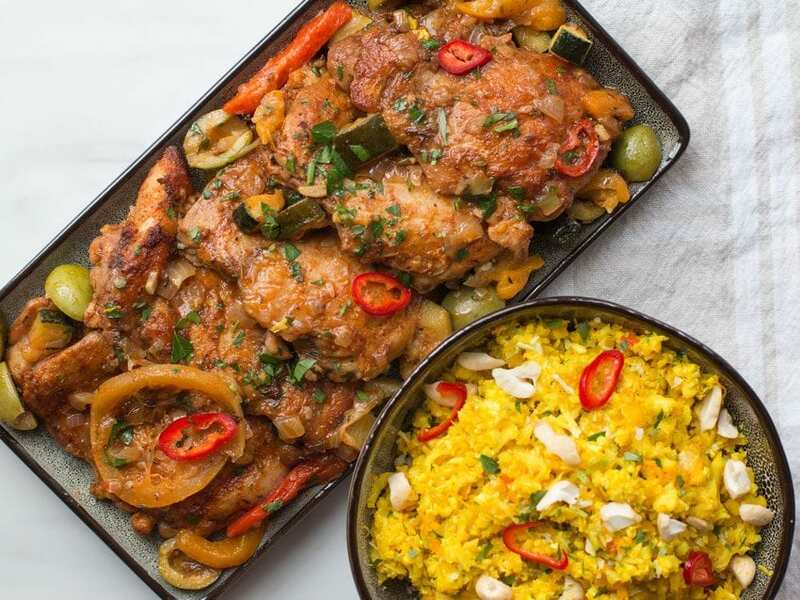 This looks great, but I’m not a fan of cauliflower – can you recommend a low carb substitute? Hey Tim, how about broccoli florets, large pieces of zucchini or just cook the chicken with a bunch of chopped kale? Made this tonight and loved it! This is our second recipe from you and will not be our last. My husband and I are down over 125 pounds since starting Keto last year and we love trying new recipes to keep things interesting. Thank you so much for sharing! So glad to hear it, Alexis!!! Keep it up! 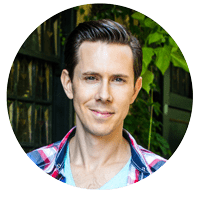 Lots of delicious keto recipes here! That sounds delicious! Happy that everyone loved it! Keep on cookin’! 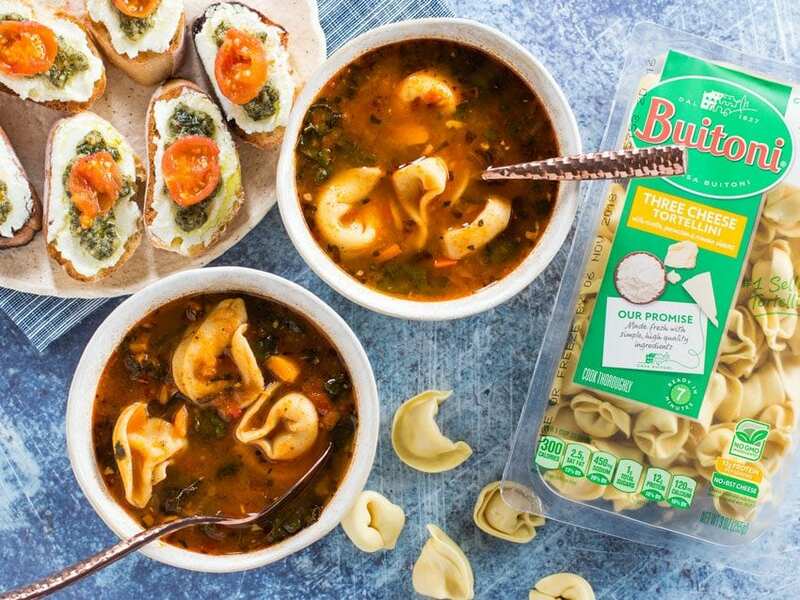 Next time please send me a DM on Instagram so I can see your food pic – I didn’t see it with the tagging method, but I certainly would love to see it!